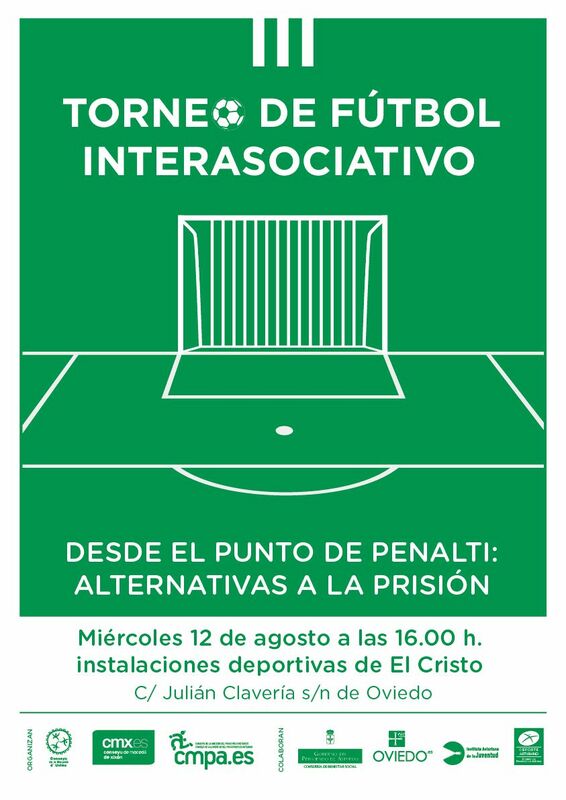 The young Association XEGA XOVEN will participate in the tournament and claiming inter-association football «From the penalty spot: Alternatives to Prison», organized by the Youth Council of the Principality of Asturies (CMPA), the Conseyu de Mocedá de Xixón (CMX) and the Conseyu de la Mocedá d'Uviéu (CMU) to mark the International Youth Day. What you propose alternatives to prison that would improve the "resocialization" of people punished in the Spanish state? Specification assaults on LGTBIQA+ people in the penitentiary. According to the report on incidents involving hate crimes in Spain in 2014, those relating to identity or sexual orientation are the most numerous of the registered, with 513. If we continue to train professionals to deal with complaints to the identify of specifically, we will have more data to study and analyze this problem more effectively. Investing in crime prevention, social education with a strong, rich in values of gender equality and respect for diversity. From the LGTBIQA+ community, we know that machismo is the scourge that generates the majority profile of aggressors, and not only to LGTBIQA+ people, but to any different reality that is considered outside the social norms. The problem should be reduced from the beginning, with prevention, supporting initiatives that combat sexism both in schools and in the cultural life of the country and social measures. Supervised program of education for social reintegration related to the scope of the crime. It could be supported by related to the field of crime associations, keeping distances with vulnerable people of the association. The realization of this program should not be changeable or reduced in exchange for economic value, generating social inequalities and rehabilitation after a crime seems inescapable. Work on behalf of the Community to be related to the field of crime. The football tournament will take place on August 12 at 16.00 in the sports facilities of El Cristo (Uviéu/Oviedo). If you want to go to encourage the rainbow team ... You are welcome!